Hi Everyone. I am back…too bad the bees around here are leaving. It is getting cold here in California, and the bee activity has been down for the past few weeks. I still see honeybees, but have not seen any native bees. Since I have not had any time to go out and take photos, I will be sharing bee photos from a great new friend that I met through this blog. Cynthia King from Morgan Hills, California took this photo of this male carpenter bee in a San Jose, Ca. nursery. This is a male carpenter bee, which I think may be the Valley Carpenter bee (Xylocopa veripuncta). The females of this species have a similar body style except they are metallic black and minus the fuzziness. For this species of carpenter bee, the males look very different from the females, but not all the species behave this way. For some species, both the male and female are metallic black, except the males are smaller. But this species has that nice obvious difference. 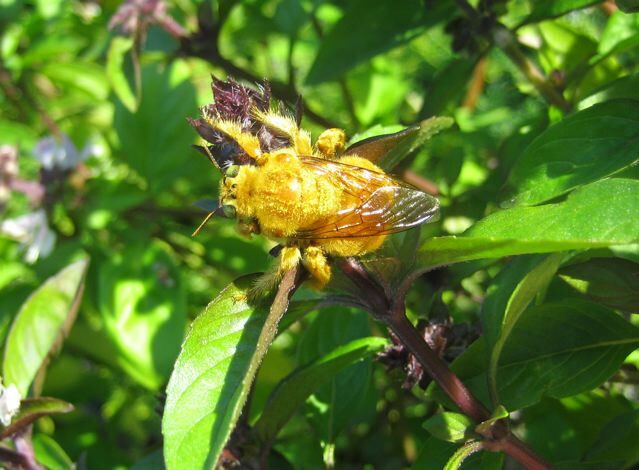 The Valley Carpenter bee are one of three species of carpenter bees found in Southern/Northern California, and are the largest bees found in California. They look like little tanks flying in the air. Cute but intimidating…yet gentle. This male was found resting on a lavender plant, he more likely slept there and was starting to wake and warm up. I assume he was sleeping there since many male bees sleep in flowers, on twigs, branches, etc. These bees may look scary (especially since they are big), but they are truly gentle. They will not sting you unless provoked. And come on, if someone was poking at you wouldn’t you want to sting them? Cynthia could have actually grabbed this guy without being stung. Why? Because he is a male bee and males do not have stingers. Here is another great photo of this beautiful golden fuzz. I have always loved the vivid orange color with emerald green eyes. When the males are out flying they look like fireballs flying through the sky. They are just gorgeous. So if you live in California and manage to see one of these flying around, take a moment and admire its beauty. These guys (and girls) are usually around from spring to fall. For more information about these bees visit the U.C. Davis Department of Entomology. Thanks for the photos Cynthia! Posted in Bees, bugs, insects, Nature, pollinators | Tags: Bees, California carpenter bee, carpenter bee, male carpenter bee, male valley carpenter bee, native bees, valley carpenter bee, xylocopa sp. Hi friends. Before I left for California I met with my friend Greg Corman to build a native bee condo using 100% recycled materials. While I was at his place, I noticed there were barrel cactus flowers open…and many many cactus bees flying all around and into them. I was completely overwhelmed by their numbers. They were beautiful and amazing. Planting native plants in your garden can attract many beautiful bees like these. Greg’s home had many native plants, so there seemed to always be something there for the bees to eat from spring through fall. This is why he has so many bees…and many different species of bees. These are a few photos showing the bee party going on in his yard. How many bees can crowd into a cactus flower? Do you see the tiny metallic bee on the petal near the middle-right side of the flower? These types of flowers not only attract specific species of bees that only use cactus flower pollen, but they also attract those bees that use all types of pollen. There were so many bees flying around visiting all the flowers, that some didn’t want to wait their turn and instead began visiting flowers that were not entirely open yet. Once the bees saw others going into these semi open flowers, others began flying towards them to get in on the action. You can have many beautiful bees like this around your home if you provide the right environment for them. Giving them food and homes will bring the bees to you. And many flowers require pollination from pollinators in order to reproduce, so it would be good to have them around. During my lunch break I have been walking around the patio behind the building I work at. The building is on a small cliff overlooking the ocean, so I spend some time watching the waves, birds, boats, and the occasional swimmer. But, the patio is also filled with many plants. Many flowering plants. Looking at the flowers and watching for bees is what I do after I finish eating my lunch. It was worth it. So much action is going on…you just need to look. I saw many honey bees visiting flowers. Like this girl, who buzzed around from flower head to flower head, gather pollen and nectar to take back to the hive. She caught a honey bee! Lunch time! Hi Blog readers…I’m back!! I had to take a break while moving to California. Having no internet at home made it hard to blog and get the house ready for movers. Well, I arrived in California last Friday and now have internet at home, so blogging will resume. Here is what happened in the past three weeks…and of course it involves bees. I got together with my friend Greg from Gardening Insights. He was nice enough to offer his recycled items for us to make a native bee nest so I could have one in California, and so we did. It took all day, but it was definitely worth it. First, we started out with this old wood that Greg had gotten his hands on. It was beautiful and rustic looking. Since bees that would use this nest like to bee (had to throw that in) off the ground, we used some old pipes that were lying around Gregs garage to give the nest some height…or legs. After a few times using the metal cutter, grinder, drills, adding a few screws and washers, and cotaing the outside of the wood, we finally got it done. As soon as I put it outside my Tucson home, leaf cutter bees began using it. When it got time to move, I plugged the holes, packed it into the truck and off it went to California. Here is the finished product, standing in my garden in California. I will keep everyone posted as to the types of bees that begin using the nest. If you would like to learn more about Greg Corman’s native bee sculptures, you can visit his website at http://www.gardeninginsights.com/ and look at his bee sculptures. Thanks for your help building this nest and for all the work you are doing to help native bee’s thrive! I opened one of the sticks and found some cocoons inside. The bees are usually found within the cocoons, and these two had live baby bees (larvae) inside of them. Since these cocoons had living bees inside of them…I wanted to rear them out, which means I am keeping them to see what bee emerges once it is ready to come out. Much like butterflies, bees also go through metamorphosis and have to wait inside their cocoons until they are adults and ready to emerge. This is what I am waiting for. So, I put them in a chamber, labeled with information, waiting…and waiting for them to emerge. So that is what I have been up to. This process will continue until I have cut all my bee sticks open. How long will this take? Well, it all depends with what else I have going on. Each nest takes a while to open. You have to be very careful and delicate. you don’t want to open a nest and have things fly everywhere. Oh no…that would be very messy and bad if you are trying to collect all the nest contents. Say hello to this bee. She belongs to the genus Osmia, so I refer to her as an Osmia bee. These bees are in the family Megachilidae, which are known as the leafcutter or Mason bees. So they are related to the bees that I am currently boarding in my bee condo. The Osmia bees are widespread, found in Eurasia and The New World. There are 135 species of Osmia found in North America, but they are more common in the west. Here in Tucson they are rare since they do not really like the heat. The photo was taken in my yard at the beginning of spring, when the wildflowers are blooming and the temperature is cool. I was excited to find this girl nesting in my yard! These bees nest pretty much anywhere they can. They are also solitary, so there is only one female per nest. They prefer cavities that someone else has created, like the bee condos or hollow plant stems. They have also been known to nest in snail shells! Osmia bees are small to medium sized bees with robust bodies. Most of them are metallic…brilliant blue, green and even purple metallic colors. I think they are just beautifully colored. Osmia bees (as well as all the bees in the family Megachilidae) carry pollen on the underside of their abdomen, unlike most other bees that carry pollen on their back legs (a structure called the pollen basket). There are several species that are used for orchard pollination: Osmia lignaria a.k.a. blue orchard bee (native to N. America), Osmia cornifrons a.k.a. hornfaced bee (used in Japan), Osmia rufa a.k.a. red mason bee (used in Europe), and Osmia ribifloris a.k.a. blueberry bee (native to N.America). There are several companies in N.America that are currently evaluating and trying to use the red mason and hornfaced bee for pollinating their orchards… I know of a few almond and blueberry orchards that are currently working on this. Look for these beauties when you go out…especially all of you in California. They are abundant all across California. I have worked on 6 species in the San Bernardino Mountains. You all may need to go out and look at natures beauty during these tough times. Happy National Pollinators Week! Across the nation people all around are focusing on the importance of pollinators…so why not join them. Many of the blogs out there have great material to celebrate such important insects…the ones that pollinate our food and flowers. Bug Girl has many links to sites that contain a complete list of crops that are insect pollinated. Many people do not realize that every third bite of food is directly or indirectly a product of insect pollination. If you eat beef…thank the bees. Yes…bees help with beef. Alfalfa bees pollinate the alfalfa that is feed to cattle. There you have it. It’s like playing the Kevin Bacon drinking game, except with pollinators. What am I doing? My work with pollinators never actually stops, and I have been trying to get the word about their importance. This Thursday I will be giving a talk at the local botanical gardens about bees and their role in pollination. NAPPC (The North American Pollinator Protection Campaign) and Pollinator Partnership (who I am currently employed by) have a great website with many resources to help you celebrate pollinator week. There are links with events that are happening at in your state, kits to host a party, and recipes using ingredients that are insect pollinated. Take this time to appreciate the pollinators. Today was a great day. I met with Greg Corman who is the owner of Gardening Insights. Greg is an eco-friendly landscaper here in Tucson, AZ. Today we met to talk about native bees. You can see why it was such a good day. Coffee, bees, ways to increase native bee populations…a few of my favorite topics. Greg has started building bee habitat sculptures which he sells for people to place in their gardens. As Greg’s website states, it’s Art meets Ecology in support of native pollinators. I was invited to his home to check out some of the sculptures and brainstorm more ways to help native bees. The sculptures were amazing. Some were very Zen, others were rustic , but very artsy AND VERY useful for those bees that may not have found nesting sites. While looking at one of the sculptures (which had at least 150 nesting sites/holes), eight female leaf cutter bees were buzzing around searching for their nest. They didn’t care that I was there. They just buzzed and went about their business. Many of the holes were already filled and capped/covered with material to keep intruders out. Some holes were covered with soil, others with small rocks, sap, and plant resins…like the photos below. The bee habitat sculptures attract those bees that build their nest in above ground cavities like twigs, abandoned beetle holes in trees or stumps, or any other place that they can find. Some of the bees that were buzzing around were a type of leaf cutter bee in the family Megachilidae. Here is one that is about to gather pollen from one of my cactus flowers. I get excited when I hear about people helping out native bees and for that matter any pollinator. Again, they are very important for our livelihood, and their populations seem to be decreasing (my research also showed this), so please support them and help them out. You can build native bee condos, or buy sculptures like those that Greg creates if you would like to have beautiful art as part of you landscaping AND help the bees out at the same time. You can also plant a pollinator garden to give them food while they are out. Oh, and another point regarding the sculptures…they are made from 100% recycled material. Buzzy is Back! And I passed…I defended my Master’s research and passed. Yay! Thanks to everyone who sent well wishes. Your thoughts were greatly appreciated. Now I have time to…well, work on my manuscript (more), get ready to move to California, and find a job in California. Hint, hint…any Californians hiring? O.K. back to the bees…I mean what could be better, right? So here they are…the bee bachelors. In previous posts (and here) I wrote about how male bees usually do not sleep inside the nest with the females, but they find their own places to bunker down for the night. Some sleep in flowers, others cluster together by the hundreds on a tree branch, and others will chose a branch or leaf to bite down on and hang on for the night. It was like a bee bachelor party was going on! 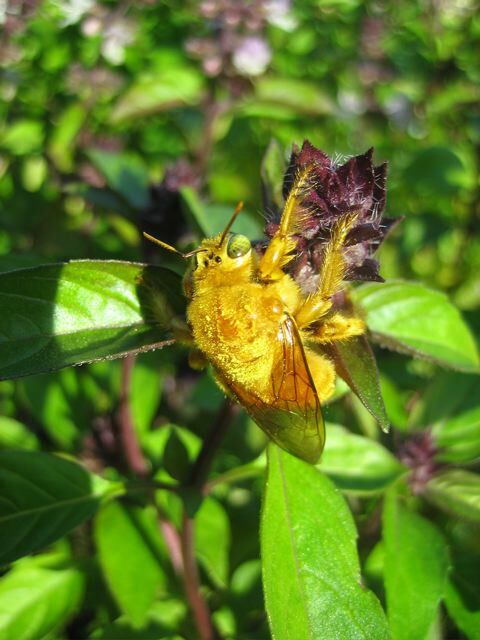 For more lovely photos of sleeping male bees, please visit goodbears new nature blog and Eric Eaton’s insect blog with photos of sleeping male longhorned bees (I love the long horned bees…they are absolutely adorable! ).